Nowadays it is quite common for both parents working and trying to take care of their children. A busy lifestyle often makes parents very difficult to share any activity with their children. John Lau International School of Taekwon-Do offers beginner classes specifically designed for parents and children. The family classes allow parents and their children to share a common interest while they can gain health benefits. Children also thrill to have their parents joining them in their classes. Our Taekwon-Do program for children is simple, fun and easy. This program emphasizes in teaching children the importance of obedience, neat appearance, good manners, and responsibility. We encourage our students, by reminding in class, to dress themselves, brush their teeth, fix their own bed, etc. 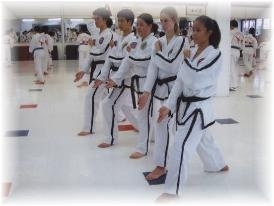 Students develop physical practicing basic Taekwon-Do techniques such as punching, kicking, target practice, and stances. Through this basic training, students will also develop better coordination, and reflexes. Students in this age group continue developing their basic Taekwon-Do skills, techniques and discipline. Students are encourage to participate in more school sponsored activities which are designed to help students to develop their leadership skills through the caring of younger students. In class, instructor's request of putting on protective gear within a short time is a means to encourage teamwork among students. Senior students will need to assist younger ones to complete instructor's request on time. Another way to teach students about caring is to allow senior students to inspect younger ones to make sure they dress properly and not to disturb class in progress. For black belt students, we encourage to learn about the responsibilities of being an instructor. Each year our school trains many instructors. Each instructor must go through various training and examinations. To qualify as an instructor one must have expert knowledge of Taekwon-Do techniques and more importantly, must have patience, desire in caring for students and have good manners. Learning how to be an instructor is one of the most important leadership skills. Every year our school's tournament is also a very good learning opportunity for students. Black belt students with higher degrees will learn how to judge in competition, how to handle unexpected situations and how to work with the referees, as a team. Students will realize their full potential and learn the importance of continuous self improvement. All these skills will benefit them in the future.